I haven't got so good spatial vision, so I cannot draw same thing from different angles (for example two eyes). 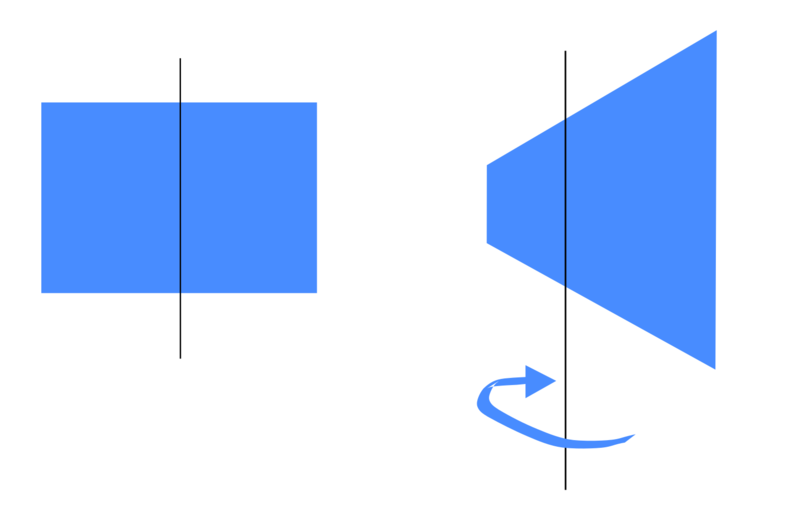 I know this question can be a little weird, but is there any tool in Inkscape to rotate a 2D object as a 3D object, like in the picture ? Or should I use other program to do this ? A small rotation, 10 or 20 or 30 degrees, maybe more depending on how believable it should look, can be faked with a perspective tool. Squash one side to make it look farther away. But the spacing of details from the 'far' side to the 'near' side doesn't change quite right. Features need to be closer together near the far side. It's hard to get right. A simplistic perspective tool won't do this at all, being just a position-depending scaling. A 90 degree rotation can be faked by scaling to zero along one direction. But I'm sure no sane graphics designer has a reason to do that, other than as one frame in an animation. What about an 85 degree rotation? It's not the shrinking of the 'far' side that matters as much as scaling nonuniformly to bring the near side and far side close together. The amount of shrinkage of the far side is determined by the distance of the imaginary camera (viewer's eye) from the object. Some perspective tools are better than others, but none give you control over simulated viewpoint distance, angle of rotation, or really look right. They're meant for fixing photos of building and other rectangular objects. One fairly decent perspective tool exists in GIMP. GIMP is in the same price range and philosophical school as Inkscape. This means converting to raster, and so if your rotated object has vectorial details you may want to tweak later, well, no, you won't be able to do that. For some tips and tutorials on perspective distort, see http://goinkscape.com/using-perspective-for-3d-in-inkscape/ - it works, but something about the geometry isn't right to my eyes. For believable rotation effects, I'll always fire up Blender, make a rectangle, plop my image onto it, and rotate as I please. I can fake distance effects such as fog, focal depth, nonuniform lighting, maybe lens distortions, and have it all be animated, which is the usual case. The big disadvantage of this for most 2D artists is that, of course, you must be comfortable with Blender and 3D manipulations. How can I avoid auto-adjusting of the text dimensions in Inkscape?